Ginger may help to fight ovarian cancer, US scientists believe. But UK cancer experts said that, while ginger may in the future form a basis of a new drug, more research was needed to corroborate the findings. Ginger is already known to ease nausea and control inflammation, but the findings by the US team offer cancer patients new hope. 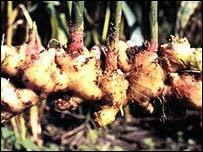 Researchers used ginger powder, similar to that sold in shops, which they dissolved in a solution and applied to ovarian cancer cells. They found it caused the cells to die in all the tests done. But it was the way in which the cells died which offered even more hope. The tests demonstrated two types of death - apoptosis, which is essentially cell suicide, and autophagy, a kind of self-digestion. The researchers warned the results were very preliminary and they plan to test whether they can obtain similar results in animal studies. But they added the appeal of ginger was that it would have virtually no side-effects and would be easy to administer as a capsule. But more work was needed before firm conclusions could be drawn, he added. "This study doesn't mean that people should dash down to the supermarket and stockpile ginger.